I love weekends because I have some extra time to make a yummy breakfast. 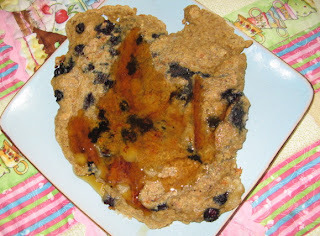 Ever since I found this book ( www.wholelifenutrition.net/) and this recipe I have been obsessed with these pancakes. Normal box pancakes have no nutritional value in them and they give me awful heartburn. I do not have any gluten sensitivities but this recipe is gluten, wheat and egg free. It is nice to give your system a break. Use some REAL Canadian Maple Syrup or some almond butter to drizzle over top. So here you go my favorite pancakes!! Enjoy!!! 1. Grind oats to a fine powder (I use a coffee grinder). Place ground oats, baking powder, and baking soda in a medium sized bowl and stir together. 2. In a separate bowl, combine milk of choice, coconut oil, maple syrup and mashed banana and stir together. Then add the wet ingredients into dry and mix together. 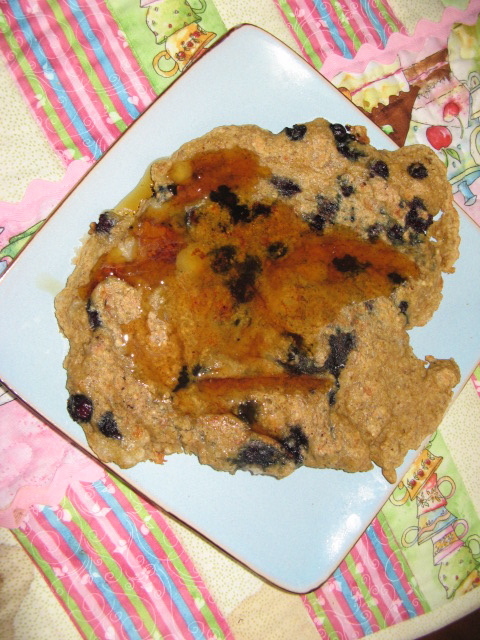 Try not to over mix the batter and gently fold in the blueberries. Add more milk of choice if batter seems too thick. 3. Heat the skillet over medium heat. Add a little coconut oil and drop ½ cup full of the batter into the pan. Cook for about 2 minutes on each side. Watch those yummy pancakes for burning; keep an eye on the heat.